I like the rough charm of industrial areas but I have to admit that this place was remoddeled a bit so that you can enjoy the old area and keep your clothes and shoes clean. My focus here is the grey thing in the picture. It is called T.R.U.D.E. 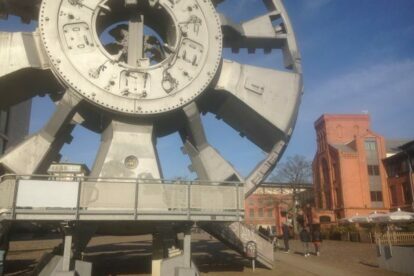 and once was the machine that cut out the new tunnel under the river Elbe in order to build a fourth tunnel. Hamburg’s traffic problem is connected to watery circumstances: a lake in the middle of town or, in this case, the separation of the northern and the southern part of the city. As you can see this machine is very, very big and as such quite impressive. If you can read in German, some display tables explain the details of the work that took nearly 3 years to accomplish by drilling the new 2560m long tunnel. Nearby, you find two cafés and the museum of work. Everything is situated along a canal so this is one of my favourite places to hang out during summertime or even enjoy the flea market that is held each month from Easter Monday (first date) till “Tag der Deutschen Einheit” (3.10.). The dates for it you can find here.